Disposable face masks can significantly improve particulate filtration and reduce contaminant levels within cleanrooms and other controlled environments. 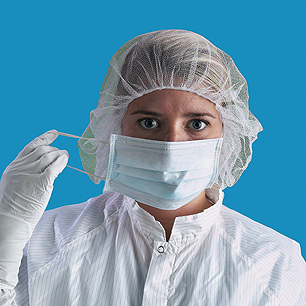 Innotech's most popular masks are the blue ear loop MASKEL-BL's and the most popular veil is the KC-62757 knitted headband face veil from Kimberly Clark. Many other styles of masks are available and include ear loop, 4 tie, single band, knitted, surgical, respirator, and latex-free options. Please browse the options below and contact us if you have any questions or special requests.